A soccer club from Chechnya has signed a player with cancer in order to give him the opportunity of treatment abroad. Fans and professionals alike teamed up to raise money for Grigory Simonyan in a campaign before Chechen President Kadyrov stepped in. A soccer club from Chechnya has signed a player with cancer in order to give him the opportunity of treatment abroad. Grigory Simonyan, who has brain cancer, has signed a contract with Russian Premier League club Terek Grozny after Chechen President Ramzan Kadyrov became aware of his plight, and will now fly to Germany for treatment at the club’s expense. Simonyan’s plight was first drawn to public attention by Russian sports journalist Katerina Kirilcheva, as a result of which a charity campaign was set up to raise money for the soccer player’s treatment. The campaign, called Save Grisha (Grigory), was launched by Russian sports website Championat.com and the Orange Sky charity foundation. The red Save Grisha post was on the website’s main page for about one and a half months. Twice daily information was published on how to transfer donations, and how much money had been collected so far. The response to Save Grisha turned out to be enormous – almost 100,000 people transferred money into the campaign account. While many donated between 30 and 300 rubles (from $1 to $10), some gave 100,000 rubles ($2,850) and 200,000 rubles ($5,700), and one person even donated 500,000 rubles ($14,200). On top of this, School No. 258, where he studied, collected 100,000 rubles, and 200,000 rubles was raised at a special charity concert. There is little doubt that it would have been possible to reach the target sum for Simonyan to receive treatment abroad – 5,000,000 rubles ($142,800). But in the end it proved unnecessary. Chechen President Ramzan Kadyrov, who is also honorary president of FC Terek Grozny, the region’s most successful soccer club, became aware of the player’s sickness and told the club to sign the player and pay for his treatment. According to Samvel Avakian, Championat.com’s soccer editor, 3.3 million rubles ($94,000) had already been raised for Simonyan when Kadyrov stepped in. “This is not a figure deliberately chosen to look good, but the amount which had been accumulated in a special account at the time when Terek decided to pay for Simonyan’s treatment and the soccer club’s managers asked us to stop raising money," says Avakian. Avakian explains that many players based outside the country donated to the campaign, including PSG midfielder Javier Pastore and Inter Milan star Ricardo Alvarez. Some players – Dinamo Moscow player Leandro Fernandez, Russian international Roman Shirokov and many others - also sent shirts. “We did not ask the sportsmen for money because we know that, being wealthy, they are constantly faced with such requests,” says Avakian. “However, this does not mean that after transferring the shirts, the players didn't sent money to Grisha’s account. It’s just that we do not know about this. For example, it took us a long time to persuade the Russian soccer player Alexander Ryazantsev to write about his donation. Everyone wants to help but they fear that it will be taken for a PR stunt." Ramzan Kadyrov, who tweeted that the republic’s soccer club Terek would sign a contract with Simonyan and cover the cost of his treatment, could have simply transferred the required amount into the charity account. But a professional contract gives the young man something no less important than the money for treatment – it gives him something to fight for and inspire him. It was an incident on the soccer pitch 3-4 years ago that is believed to have led to the tumor developing in Simonyan’s brain. It is assumed that the cause was a blow to the head resulting from a collision with a goalpost, though Simonyan’s father Vardan does not remember the exact date of the incident. "Grisha has never played anything in his life except soccer,” says his father. “The boy grew up to be very technical and at the same time a real team player, he loves passing the ball in the game, loves the sense of a certain common understanding. During the last few years, I often took him to be viewed by [Moscow clubs] CSKA and Spartak. But when Grisha got sick, we began to pray only to save his life and health." Simonyan’s priorities also changed when he fell sick. He had a soccer ball in his ward and would touch it from time to time, the object he used to spend all his time with. But according to his loved ones, at this stage Grisha had decided to give up on his dream of playing soccer. Simonyan got a surprise on February 27 when Armenian international and Spartak Moscow forward Yura Movsisyan gave him his autographed shirt for his birthday. 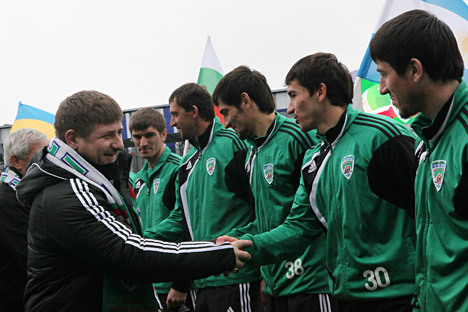 A month later, Simonyan received a trunk containing the full set of equipment given by FC Terek to each of its players. "Doctors have told me that 40 percent of the success of treatment depends on the person's emotional state,” says Simonyan’s father Vardan, “so I now have the feeling that Grisha is not sick at all. And although I try to forbid it, (my son does not really listen to his father) – every day he spends from around half an hour to an hour and a half with the ball. It is a true miracle and a real joy that we caught the eye of a man who understands."